I’ve been writing Convince & Convert for more than three years, and I continue to be grateful and delighted that you choose to spend time here, when faced with a tsunami of blog options. I continue to find it fascinating, however, that even though this blog is probably considered successful within its very small niche, approximately 70% of the visitors here are first-timers (according to Google Analytics). And approximately 35% of you came from a search engine. You know what drives magazine subscriptions? Newsstand sales. Readers don’t start loyal. They sample the product first, and decide they want consistent consumption. Blogs work the exact same way, except Search is our newsstand. I’ve read several posts from other bloggers eschewing the need to pay attention to the principles of search optimization, arguing that the “community” and “engagement” and “sharing” will supersede the impact of search. They are wrong, and a new research project I just finished proves it. For a seven week period, I worked with InboundWriter – an easy-to-use tool that helps optimize your writing. During that period, I created seven new posts here using InboundWriter, and rewrote five classic posts to make them more search friendly. The results were significant and immediate. And these results weren’t unique to Convince & Convert. Our research also included content from toy e-tailer ebeanstalk.com and blog network linkorbit.com. In each instance, we found increases in search traffic – and in some cases significant bumps in time spent on site. Whether they can precisely articulate it or not, the reality is that readers are looking for something when they come to your blog. If you can give them content that is focused and uses the words and phrases that they use, you have a better chance of attracting and keeping those visitors. 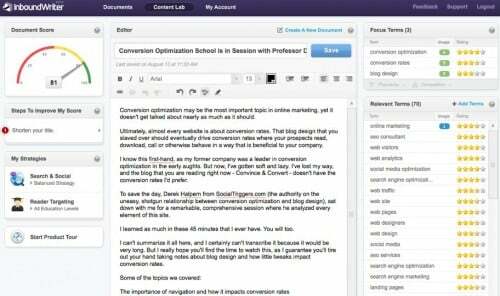 There are several ways to make your content more search-friendly, but InboundWriter (in public beta) is perhaps the easiest to implement – especially for writers without SEO background. The InboundWriter website (or WordPress plug-in) recommends appropriate keywords based on your sample copy and an examination of other (even competitor) websites you select. Then, the system gives you a live, real-time SEO score (1-100 scale) that changes as you write and edit. It’s intuitive for all, and is completely free for the first batch of documents you create each month. The full-blown plan is $19.95/month. To read the complete research paper, including methodology and metrics for each participating site, please visit http://www.inboundwriter.com/impact.